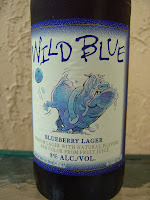 So tonight your bonus is Wild Blue Blueberry Lager brewed by Wild Dawg Brewing in Baldwinsville, New York. I was pretty sure, but here it a press release confirming this is a Budweiser product. I'm not going to get into whether they or other macro-breweries open new-named breweries to disguise and distance themselves from the parent, but it has been suggested. Anyway, this one is dedicated to PhillyKelly, who said this is her "go to beer", and that the 8% alcohol is just a bonus. I'm positive you remember meeting her when she let me publish her 2008 Christmas Card! You do, right? Oh, also of great importance is that Kelly is the ultimate Phillies fan! 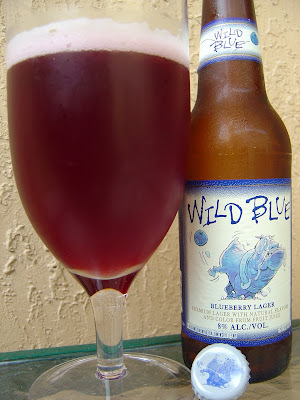 Fruit punch aroma, lots of blueberries. Now I've picked blueberries before--these smelled a little bit from concentrate. Oh, jeez. This is much too sweet! Very sugary, and more like a soda or juice than a beer. OK, I get it. Now, I'm a little confused because this tastes a lot more like grape than blueberry. After the initial sweetness, there is some acidic quality, like it's actually wine. And that 8% alcohol does provide a boozy kick and dryness. Cider-like burn, juice after brushing your teeth. Yep, both are there. You know what? I figured it out... This is Grape Mad Dog, repackaged. I knew Chung was on to something when he had the Collegetown liquor store special order this flavor! Anyway, diabetes, here I come. Final analysis. Not vile and I did drink the whole bottle, but I would prefer other Bud and Miller and Coors products, even a Presidente, over this! Lies!!! Just kidding, you can't beat the 8% though...I would recommend everyone reading this to try it for yourself. From what I've noticed, it does seem more popular with the ladies! Kelly. Actually you CAN beat the 8% but maybe not with a super sweet fruity beer. Glad you found a favorite. Yeah, this one is not a favourite of mine either; sorry Kelly! 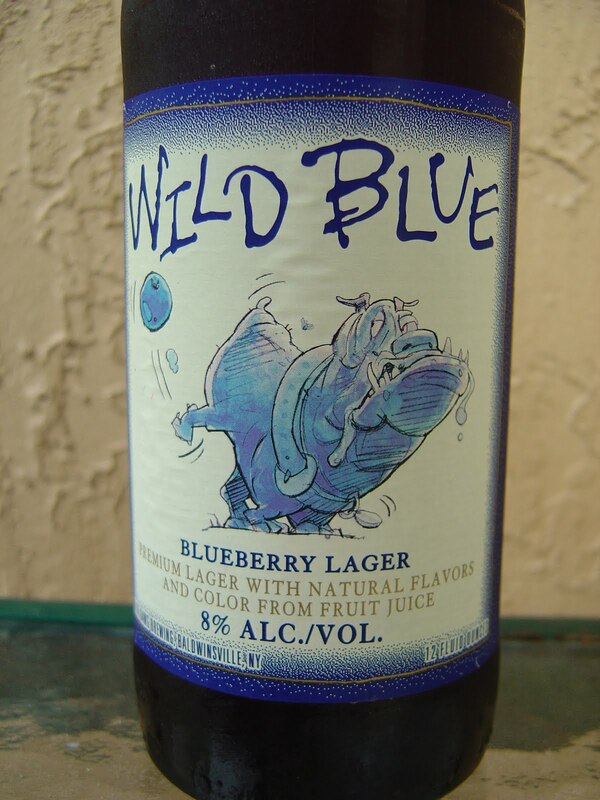 That blueberry/grapey aroma does me in every time - it smells like an Otis Spunkmeyer blueberry muffin! I don't even have to try this to know I will not like it...I like fresh blueberries ok, but blueberry flavored items are usually yucky. Like Sweetwater Blue. Bleh. Reminded me of stolen sips of Mogen David during Christmas at Aunt Hazel's as an 8-year-old. Very cheap wine like, don't fail to take a pass on this one. Fine, I'm a few months behind. But I found this sticky-sweet mess to be appaling, and undeserving of the worthy title of "beer.". More like liquified blueberry jello with a very modest dry kick at the end (the only reedeming quality, the 8% alcohol does its job here). Drink a few of these and you'll end up with a sugar buzz. Headache in the morning a guarantee. Two thumbs down. Christina M.
Hi Christina. I promise to keep you identity a secret. Yeah, this was a pretty awful liquid. Thanks Rob. Cheers! (Just don't toast me w this crap and I have 5 bottles left.). Christina M.
This is the worst-tasting beer I've ever tasted! I couldn't even finish one bottle. I just wish I could get my $8 bucks back! Michelle. As vile as this Wild Blue is, you picked the gem of the trio. Wild Red and Wild Black are despicable atrocities that make Blue look like a war hero. whatever are you guys talking about?! I am not much into beer, but I love this one! !